Making Macross toys continues to be a passion project for longtime series fan and Arcadia project manager, Mr. K. He has been working tirelessly behind the scenes since the Yamato days, and recently put up a blog post where he tries to explain why Arcadia's products have become so expensive. Since I personally don't like to dwell on price too much, I will let readers check out the translated article themselves. I will touch on it at the end of this review, but for now, let us concentrate on the Valkyrie in front of us: the VF-0A Phoenix Shin Kudo Version. Arcadia continued the legacy of Yamato with their release of the VF-0D Phoenix, a toy that in many ways was both an end to one era... and the beginning of another. They quickly teased more Macross Zero Valkyries, with both Shin Kudo's and Roy Focker's single-seat VF-0s making the rounds at trade shows. These new toys were, of course, based on the same engineering as their VF-0D, just "downgraded" to the more familiar swing-wing design. Most of my complaints about the big blue bird stemmed from how the massive delta wings and extra fins tended to interfere with what felt like a solid Variable Fighter figure. In a sense, I fully expected the VF-0D to be tough to handle, and yet that very same outcome assured me that Arcadia's take on the standard VF-0 design would be a much simpler, and more enjoyable, experience. Please check out my video review! The latest toy incarnation of the early Variable Fighter pioneer makes for a stunningly beautiful aircraft. While Yamato's take on the VF-0 was quite good for its time, the thick panel lines, and somewhat thicker midsection, shaved a bit of sleek aerodynamic grace off the design. The new VF-0A's use of diecast internal mechanisms, tighter parts fit, and finer detail all combine to make the toy a feast for the fingers as well as the eyes. Here is the old Yamato VF-0S alongside the new Arcadia VF-0A. Now, with the basic design of the VF-0 being a CG model, it means there isn't much room for interpretation when making a transformable toy out of it. As such, the differences between the Yamato and Arcadia figure are not as dramatic as, say, the original Yamato VF-1 and its later perfect transformation version. Still, handling both toys will invoke a very palpable sense of progress made over the 9 year gap between these releases. However, there is one odd downgrade with the new toy, as it does not use clear parts for its front wing lights, and just has them painted dark gray. That being said, the new VF-0 is largely identical to its predecessor in terms of gimmicks and accessories. You get one large gun pod, four underwing missile sets, two FAST packs, two pitot tubes for the nose, and three stand adapters. Interestingly, the FAST packs do not use magnets like on the older Zero, simply tabbing onto the legs with friction instead. Also, you may have noticed that this VF-0 is lacking some of the tampo printed markings of its predecessor (like the UN SPACY text on its legs and packs). As noted before, Arcadia is trying to keep costs down, which has lead to fewer pre-applied details. However, there has been a little give and take to this, as the original Yamato VF-0 toys did not have their UN Spacy roundel on the nosecone and had to rely on a sticker. The Arcadia version seemingly traded one set of markings for the other. At the very least, the Arcadia VF-0 does come with a full set of stickers for filling in the missing markings. The new VF-0 retains the opening cockpit gimmick, but achieves it with a sliding hinge arrangement, which feels much smoother than the half-ring hinge on the old one. Also, the cockpit is given a very detailed tampographed control panel, which adds to the cockpit's authenticity. And the seat reclining gimmick is present on Arcadia's Zero as well. It's a neat idea, but without being able to access the cockpit in Battroid mode, I feel like the effect is wasted. You can still flip out the air-brake for authentic airplane action. Around back, the feet open up to reveal painted jet turbines. On this VF-0, the panels that make up the foot open via smooth hinges, rather than ratcheting joints. Also, the tailhook on the backpack can be raised or lowered for a carrier landing. Both intake covers can be removed to show the business end of the engines. The large C-shaped stand adapter can connect the VF-0 to any Macross Simple Display Stand, or the original Sv-51/YF-21 stand it was derived from. It clips into the shallow slots on the middle part of the leg/engine, and can be difficult to pry back off once attached. As such, I'm just leaving this adapter in the box, like I did with the VF-0D. A quick note on the landing gear: the trio of diecast struts are hard to get out without a bit of help. I generally use a soft tool (like a toothpick) to pry gear out of its bays. Also, the gear doors are exceptionally flush against the bottom of the plane, so be cautious the first time opening them. Each large door is on a sliding joint that moves out from the main body so it can then hinge open. Arcadia seemingly anticipated the need for their new VF-0 to be compatible with a Ghost Booster, by including an alternate set of dorsal fuel tanks with slots for the extra equipment. In practice, however, these do not appear to be compatible with the old Yamato QF-2200 Ghost accessory. The slimness of the Arcadia Zero's main body means there is not enough room to tuck the tips of the Ghost's canards under the dorsal tanks without stressing them. Personally, I am not so much disappointed by this result, just sort of confused. Non-Japanese speaking fans are forced to be on the periphery of Arcadia's line of information, so it feels like something got lost in translation when Mr.K. talked about the compatibility of the old Ghost with the new Zero. Looking back, I feel like I should have realized when I got my VF-0D that this couldn't work, as the Arcadia toy's revised proportions are not even close enough to kludge on the old accessories. Also, the top-mounted missile packs from the Yamato Ghost Booster set flop around inside the Arcadia's toy's mounts because the tab is sized too small. To me, this indicates that revamped Ghost Booster may be on the horizon, as the alternate fuel tanks are specifically called out in the instructions as being for the extra equipment. Honestly though, uncertainty about potential future accessories does not detract from the piece in hand. While it's no surprise that the single-seat version of Arcadia's Zero carries over the general fit and finish of their beefier VF-0D, the more streamlined VF-0A makes for a much sleeker aircraft that is easier to handle as a toy. Arcadia's version of Shin's VF-0A has a fairly screen-accurate light gray fuselage with white striping, which helps enhances the look of its aerodynamic form. Shoji Kawamori is famous for designing transforming robots that have realistic looking jet modes, and this toy really brings that quality to the forefront. And of course, transformation is half the fun of any Valkyrie toy, so the Arcadia VF-0A goes through the familiar motions to convert to Gerwalk mode. If you are familiar with the previous VF-0 toys (or Yamato's perfect transformation VF-1 toys for that matter), the process is largely the same, so please watch my video review if you need to see it in more detail. One thing you should be aware of is that the lighter gray and white paint work on this figure is rather thinly applied, so paint scratches are a point of concern. The resulting bird-walker is readily recognizable as a Macross machine, and benefits greatly from the diecast-enhanced arm and leg joints. One major difference between Arcadia's VF-0A and their VF-0D, is the addition of triangle-shaped panels that help hide the accordion-like knee area in fighter mode. These are fixed in place, which means the panels can get in the way of swiveling the arms out for Gerwalk and Battroid mode. Just go slow and try to have the shoulder pads posed up in a vertical position to allow for more clearance. I will say that, overall, my old Yamato VF-0S is easier to convert from one mode to another, but a lot of this is due to just how much tighter the build is on the new toy. Again, the motions are basically the same, but a factory fresh Arcadia VF-0 takes more to effort to move its limbs around. A lever hidden underneath the tailhook allows you to slide out the backpack thrusters. I found the lever to be a bit stiff, so I used a toothpick to help it along. Once out, the engine bells can be moved around on their own individual ball-joints. And like with fighter mode, Gerwalk mode has its own dedicated stand adapter. This attaches much more smoothly, though, with the piece simply clipping onto the diecast swing bar under the main body. Following the predictable conversion to Battroid mode yields a pleasingly solid robot figure. Again, the diecast innards for its arms and legs make this Zero feel really good in the hands, and help eliminate the unfortunate plastic quality problems of the old Yamato release (I still have those parts on my Shapeways store if you need 'em though). Please note, there is a discrepancy with how the back wings fold over on my figure. The official photos on the back and in previews have the blank wing over the one with the UN Spacy roundel, but on my Zero it works a lot better the opposite way. In either case, be aware of possible paint rubbing when bringing the wings together. For Battroid mode, I engaged in a bit of parts removal, as I prefer not leaving the pitot tube attached behind the hip panel, like in this picture of my VF-0D. That is where it's supposed to go, but it never feels safe there. In addition to smoothing out the fighter mode with extra panels, the VF-0A adds a pair of flip out covers that hide gaps in the upper chest that are left by the transformation. It's a very subtle aesthetic improvement, that works quite well. The A-model head is something the Macross Zero audience didn't get a lot of time to appreciate, so I am really into having it in toy form. It has a pair of clear green camera eyes clustered in a black frame, not unlike the DYRL version VF-1A monitor turret. There's some neat detailing on the back of the Zero's head too. Overall, it has a very "Armored Core" vibe, which makes sense given that Kawamori worked on both series. The VF-0A's neck is interesting, as there is a small metal double-hinge inside the main assembly. This allows the head to compress down for fighter mode, as well as look all the way upward. There's even a bit of waggle in the joint, as the head itself connects to the double-hinge via a ball-joint. So both the leg fins and the calves on the VF-0A use the same blue as the entirety of the VF-0D's body. Most fans are used to seeing those areas of the single-seater rendered in a dark gray, which mostly matches what is seen in the OVA. Whether this was a case of Arcadia deciding to go with what some select scenes of Macross Zero show them, or if it was a mandate from Big West or Satelight, is unknown at this time. The result does help give Shin's machine's a more cohesive look, but I understand that this deviation has been a head-scratcher for some fans. Makes me wonder if the change was done in order to help distinguish this VF-0A from the "Mass-production type" Arcadia teased at trade shows, as that toy has an overall darker palette but is still very similar. Honestly though, I have no strong feelings against the color change, because the majority of the toy is the proper gorgeous light gray with the darker parts still providing the right amount of contrast. So with all that minutiae out of the way, let's focus on the toy itself. Oh my, it sure is a real pretty bird man. "Oh my! The newest Zeroes are quite elaborate!" At around 10 inches tall in Battroid mode, the Zero is sized to deal with large encounters. The VF-0A holds its up-sized gun pod pretty well, although like the VF-0D it brought back the slightly off hand-style with the offset pinky. The tidier VF-1 style wings grant the VF-0A a much wider range of movement over the delta wing D-model. With a bit of maneuvering, the standard Zero can actually kneel down like a giant soldier should. Truly, nothing is more "real robot" than taking a knee. The pull-out hip joints allow for some wide-legged poses. And you can "cheat" a bit by unlocking the back plate from the metal swing bar, in order to allow the Zero's legs to swing farther forward and back without using the Gerwalk joint. The ankle joints are the now standard metal and plastic ball-socket joint, with an additional pivot above the main joint. They feel stiff enough on my figure to allow for good poses, but it can be hard to adjust them in a gradual way, just due to tightness. I find using the angled edge of the foot is another good way to setup different stances. And like with the other modes, you get a dedicated stand adapter for Battroid mode. It's the same weird-looking nosecone cradle that the VF-0D came with, and it does its job admirably. You do have to pull the hip joints out so that the adapter can grip the exposed metal bar as tightly as it can, though. With some perseverance, the VF-0A can achieve a cool fully-loaded flying pose in Battroid mode. 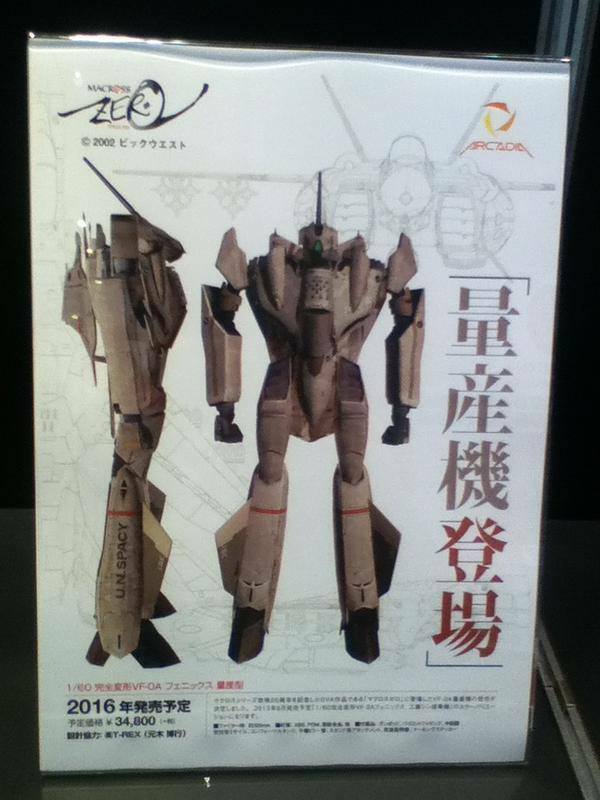 Arcadia's Perfect Transformation VF-0A is another high-end Macross toy that I am very much enjoying. As a much more straightforward design, it benefits from all the improvements in their VF-0D but without the larger, cumbersome wings to get in the way of handling and posing. Mine also doesn't suffer from stupidly tight joints, like on my other Arcadia Zero. However, the figure's high price, and gray market status (which prevents direct customer support from Arcadia) for those outside of Japan, add some uncomfortable caveats to this toy. I feel a lot of passion for these figures from Mr.K and Arcadia itself, and sympathize with the hassles and expense involved with making high-end transformable toys. That said, I know a lot of foreign buyers approach their Macross products with increasing trepidation as the prices increase, and that is understandable. Sadly, we still live in a world where the majority of Macross-related merchandise is confined to Japan, thus denying a lot of fans access to a good customer service safety net. No matter how much I enjoy my VF-0 toys, things can and do go wrong, but that's true of any transformable toy, no matter its price. I realize Arcadia's attempts as cost-cutting have rub some the wrong way, but I see it more as trade-offs with mostly positive benefits like better materials (i.e. diecast vs. plastic in key areas) and better build quality. The feeling of the toy in hand is a big factor to me, and I find the new VF-0A to be really satisfying in a tacticle sense, in spite of the paint scheme discrepancies. In the end, this toy is in a similar situation to the VF-0D - trying its best to be a crowd-pleaser, but walking the razor edge between price and satisfaction. And it certainly doesn't help when decisions are made regarding the toy that non-Japanese speakers are not privy to, due to language, cultural, or legal barriers. Still, I enjoy what Arcadia is doing, and I will continue to support them so long as they make a jet-with-arms I want to own. The thing about Valkyries over the years with them becoming more expensive is you pay for the quality. I read Mr K's article the other day after I watched your video review. Needless to say, my Gunpla budget for the rest of the year took a hit when I was done! Fantastic review! This certainly looks better than the first version. While transforming this valk into battroid mode, the internal parts of the chest plate/canopy hood started to make squeeky noises. Then I noticed it was off-centered when the chest plate was over the cockpit. When trying to pull it back for readjustment, I noticed that the inside ridges of the hood was really tight and was scraping my cockpit plastic, leaving some nasty and severe gashes. This was definitely poor design by Arcadia. There's no replacement cockpit cover so any display in fighter or gerwalk mode is now marred by this big blemish. Arcadia, if you're reading this, hopefully you will fix this problem or else there will be a lot more complaints when your VF-0S goes into market. Bandai was known for their valkyrie nose cone paint chipping off. Arcadia has similar issues but this is pretty severe in my opinion.